Strangely enough the last time I encountered playing this possessed was in Medtner’s Piano Concerto No. 2 played by Nikolai Demidenko (Hyperion CDA 666580). While the subtle Medtner only blooms when it is played in this way the Shostakovich Piano Concerto No. 2 shines in the more modest readings. When it is treated to something extraordinary - which is what Bernstein brings to the keyboard and orchestral direction - it emerges in towering radiance. The music blitzes its way forward with barely controlled fury. Try the first movement which is played with lantern-jawed aggression. “Look at me.” it shouts but, by heck, is it intoxicating. Bernstein seems to lean towards you, like Vladimir de Pachmann, saying: “What do you think of this then? Isn’t it just lovely? We can discover this together!” It’s phenomenal so do not miss it whether or not you already have the versions by Alexeev, Shostakovich and Hamelin - all very fine especially the Hamelin. It can also be had in a Sony transfer from 2002. OK so the orchestra is subjugated in a Heifetz-style balance but so what? I make no secret of the fact that this was the version that introduced me to the work. Back in 1972 in Bristol I shared a digs with a friend who knew the Shostakovich work from the CBS mid price LP SBRG72107 coupled with the Ravel G major. He played it to me and I was won over: the euphoric excitement of the end of the first movement and the lissom romance of the second. Then again my niece Jenny played the first movement on a good upright piano in the front room of her mother’s house in Deganwy. These things lodge in the memory. If the concerto trounces Kabalevsky and Krennikhov at their own game the Fifth Symphony, for all of its Janus-ambivalent political trappings and agenda is a work of dynamic and blurted intensity. It is heard in another sensational performance with the rib-cage vibrating Fifth Symphony. The strings are guttural and raw with a delightful crazing of authentic analogue distortion. 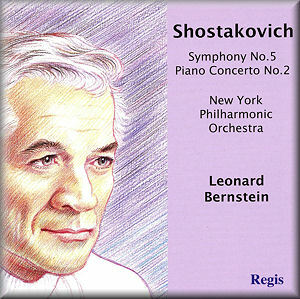 I just wish that Bernstein had recorded Shostakovich 6 at about the same time. Bernstein of that era was made for the Sixth’s Largo. Each of the two recordings ‘tizz’ somewhat, has modest distortion in loud passages and rejoices in a startlingly imperious compressed dynamic range.